So my expectations have been raised pretty high. I’m expecting to hear something that I haven’t heard in a long time. I’m expecting my reaction to say, “Way to go, Orrin, all right.” So let’s listen and see if that’s what — have you seen this, Mr. Snerdley? All right. Here’s the setup. It was yesterday on Capitol Hill. Senate Finance Committee debating the Senate tax reform bill. And it begins with Ohio Senator Sherrod Brown. BROWN: I just think it would be nice, just tonight, before we go home, to just acknowledge, “Well, this tax cut really is not for the middle class. It’s for the rich.” And that whole thing about higher wages, well, it’s a good selling point. But we know companies don’t just give away higher wages. They just don’t give away higher wages just ’cause they have more money. Corporations are sitting on a lot of money now. They’re sitting on a lot of profits now. I don’t see wages going up. So just spare us the bank shots. RUSH: All right. So we have the typical cliched Democrat criticism that any tax cut is a sop to the rich and that corporations don’t give away profits and they’re sitting out there and they’re sitting on all kinds of money and they’re not giving the money away and they’re not paying people, so this is just a tax cut for the rich. Here, now, Senator Orrin Hatch reacting to Senator Brown. HATCH: I’ve been here working my whole stinking career for people who don’t have a chance. And I really resent anybody saying that I’m just doing this for the rich. Give me a break. I think you guys overplay that all the time, and it gets old. And, frankly, you ought to quit it. HATCH: (crosstalk) I’m not through. I get kind of sick and tired of it. True, it’s a nice political play. HATCH: But it’s not true. RUSH: Well, I have to say it is unusual. I do have to agree that this is unusual for elected Republicans to be reacting to Democrat lies and demagoguery in this way. Sherrod Brown, Sherrod Brown, however he pronounces it. Is it Sherrod or Sherrod? Does anybody know? Does anybody care? All right. Okay, so Sherrod, Sherrod Brown then retorted. GRASSLEY: Regular order, Mr. Chairman. HATCH: Listen I’ve honored you by allowing to you start off here and what you said was not right. That’s all I’m saying. I come from the lower middle class originally. We didn’t have anything. So don’t spew that stuff on me. I get a little tired of that crap. And let me just say something. If we worked together we could pull this country out of every mess it’s in, but I’m telling you, this bull crap that you guys throw out here really gets old after a while. I saw this right before the program started, too, and sadly I don’t remember who — I think it was Steve Mnuchin, actually, who was — what is he, Treasury secretary, Mnuchin and the Trump administration talking about his tax cut bill and he’s talking to some media person and he’s explaining — we may even have the sound bite of this — yeah, here it is. Grab 16 and 17. HEMMER: When I hear that M-word I think it’s code, you know, and I’m used to hearing it from the left for many years. I think you are as well. I think you would admit that. But this is a Republican majority in the House and in the Senate and in the White House. And you’re admitting that for some Americans, they will pay more in taxes. Is this what the American people have waited a generation for? Republicans don’t make a big deal out of raising people’s taxes, but these guys aren’t Republicans in this sense; they’re populists. And they’re simply saying what they think a majority of you want to hear. Trump believes that most of his voters want the rich to have more pain. Or put another way, Trump believes that most of you, his voters, do not want the rich to get any tax relief, while everybody else does. And that’s so far away from the Republican signature belief on taxes, this soak-the-rich business. And then we have to listen to the old saw, “Well, we gotta raise taxes on the rich because we have to pay for it.” No we don’t have to pay. Why can’t Washington get a little smaller just once, just a couple hundred billion dollars, why can’t Washington ever shrink? So after Hemmer said, “You’re admitting that some Americans are gonna pay more in taxes, is this what the American people have waited a generation for?” Here’s Mnuchin. MNUCHIN: Just to be clear, what we’re doing is getting rid of the state and local tax deduction, which is a loophole for high-tax states. That’s the reason why New York, California, and others have taxes as high as they are because the federal government is subsidizing those taxes. And for most Americans, the vast number of Americans that don’t have high-tax states, it’s not fair that they’re subsidizing a few states. So, again, the people’s taxes who are gonna go up are the rich people in high-tax states. RUSH: Yeah. Okay. And I understand that he’s talking about the end of deductibility for state and local taxes and so forth. But see, that’s not all that’s happening here. In addition to that happening, after you reach a certain income threshold, you’re not getting a rate cut. There are two different tax increases happening here while everybody else is getting a tax cut. Now, I’m fine with eliminating the state and local taxes deduction. You know, that’s fine. That works out for me. I’ll talking about philosophically, I understand it works out for me, but this business that we have to pay for this somehow, I can’t tell you how that grates on me. What do you mean we have to pay for it? It’s like said the other day, if you have a tax cut, let’s say Washington starts out with $3 trillion to work with, that’s what they collect every year, just making up a number. It’s fairly close, three trillion. And then come along and they tout a major, major tax cut. And the tax cut means that you are gonna keep more in your pocket, you’re gonna pay less. So Washington’s gonna have less than three trillion. No, they’re not. Washington’s not. They’re gonna find a way to make up the difference. So if after all of this is over they still have three trillion then what the hell tax cut has there been? Part and parcel of a tax cut is the shrinking of government. In this case it is a zero-sum game, but not totally because Washington will end up with more revenue if the rate reduction on everybody is implemented, which causes economic growth, which then causes more taxpayers to be hired, more jobs be created, and they create more revenue in Washington. It’s how it works and it does work. SUMMERS: Jamie, this is madness. It is madness to spend $300 billion taking health insurance away from more than 10 million Americans in order to finance tax cuts for the top 1% of Americans. RUSH: Stop the tape. Mr. Summers, you don’t know math yourself. You had no business being the president of Harvard. There is no tax cut for the top 1%. That’s the point. They are not whatever you said here, taking health insurance away from more than 10 million Americans to finance tax cuts for the top 1%. There aren’t any. There are not any tax cuts for the top 1%. Maybe a portion of the top 1%, but it’s gonna be minuscule if it exists. There is no rate reduction for them. Dr. Summers, the subsidies to the insurance companies were illegal, they were unconstitutional. The Obamacare mandate, ditto. Not gonna fix any of this. But you note the language here (imitating Summers), “Why, we can’t do this. How are we gonna pay for this? You can’t help eliminate health insurance for needy Americans to pay for a tax cut –” None of that happening. Not a single shred of that is happening. Well, this is how it all gets demagogued so it’s a good thing that Orrin Hatch called Sherrod Brown out on it. RUSH: All right. We opened the program talking about taxes, and we have some people that called in because of that, and we’re gonna start here with John in Covington, Georgia. Welcome, sir. Weigh in. How are you? RUSH: Ah, ah, ah, you obviously don’t know of something hidden in this bill. RUSH: You’re exactly right. The first rate on the first dollars is 12%. RUSH: In this tax bill, there is a bubble rate of 46% for people that earn a million dollars or more to make up for the fact that they only pay 12% on the first dollars. So between a million and $1,200,000, the 200,000 is taxed at 46% in order to make up for the fact that they benefited from that low opening tax rate on their first dollars. You didn’t know that, did you? CALLER: No, I did not. So you’re saying that the million or more, their resultant will still be 39.6? RUSH: That’s essentially what they are effecting, yes. Your scenario is right. You make a million dollars, okay, but not all of it’s taxed at 39.6. The first I think — pick a number. The first $40,000 is taxed at 12%. RUSH: Well, because of that, they’re not gonna let you get away with that rate on the first $40,000, so after you earn more than a million, they’re gonna tax you at a rate of 46% until they have recouped what you paid or got away with not paying at the low rate on the first dollars you. What it works out to is that people who earn over a million dollars will take a rate of 46% on the first $200,000 over one million that they earn. CALLER: Wow. It’s a good thing I don’t make a million dollars. RUSH: (laughing) But see, on balance, you’re right. Because it’s progressive, everybody gets a rate cut because the rates are being cut and everybody pays the rates as they earn money. But not the people that earn a million or more. They’re not gonna get away with that. They are gonna face a rate of 46% on the 200 grand they make beyond ’cause they’ve gotta recoup that money. I want you to hang on for a second, if you can, through the break, John. Do not go away. One more thing. RUSH: And we’re back here with John in Covington, Georgia. John, just a couple things. RUSH: I had to run through that pretty fast and I wanted to make sure that you’re not confused. So without having the constraints of time hustling me, here’s the way this works out. You’re exactly right; there are brackets, there are four brackets. And as you earn money, you increase brackets. Theoretically, a person making a million a year will pay 12% on the first $40,000, and then whatever it gets up to, to 39.6 on the marginal dollars. RUSH: Because the tax writers think it’s unfair that a millionaire should only pay 12% on anything he or she earns, to recoup that — and it’s a ballpark number, but it’s been calculated that it’s essentially a 46% tax rate on the first $200,000 earned after a million. So if you earn over a million, if you earn 1.5 million, for example, the $200,000 past one million is taxed at 46% to make up for the fact that you paid a very low rate on the first dollars you earned. RUSH: So it eliminates the progressivity, and it does signal that they are totally targeting — they’re making sure that the, quote, unquote, rich are not getting any kind of a break whatsoever. CALLER: Well, the rich are evil. That’s why. So… it’s ridiculous. 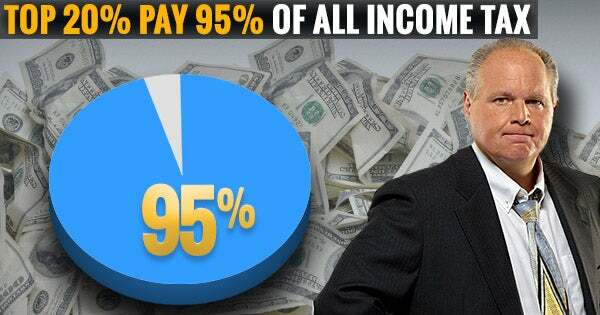 RUSH: Rich are evil and they’re not paying their fair share. Now, the other reason why I wanted you to hold on is that I would like to offer you, if you would like it — and you don’t have to take it. You know, I’ve struggled for ways to do this that make it easier on everybody. I have a new iPhone here if you would like one. I love these things, and I like sharing my passions. RUSH: And I have some that I give away. CALLER: I’d love to get one. RUSH: I’ve got the iPhone X, I’ve got iPhone 8 and 8 Plus and they’re all — the iPhone 8 Plus is a fantastic phone. The iPhone X is too. And not only that I’m gonna throw in a one-year subscription to the Rush Limbaugh website and the newsletter. I’m gonna add that, a giant little pre-Thanksgiving package. CALLER: Wow, gobble, gobble. Thank you. RUSH: I’m assuming that you want the iPhone X? RUSH: What is your carrier? CALLER: Knows right answer when told. AT&T. RUSH: AT&T. Fine and dandy. They come in two colors. They’re silver and space gray but they’re both black on the front. You’ll probably get a case for it so color won’t matter. Do you have a preference? RUSH: Fine and dandy. I hope to get this out to you so that you have it before Thanksgiving next week. CALLER: Well, thank you very much, sir. RUSH: Don’t hang up so Mr. Snerdley gets your address. RUSH: And we’ll work with you on comping you a year’s subscription to the — by the way, this is also gonna get you an official Rush tumbler which is the new special sign up gift, the premium we’re offering to new subscribers, since you essentially are one. CALLER: Wow. I should call more often. RUSH: Yeah. So it’s Christmas early in Covington, Georgia. RUSH: I’m glad you called. Don’t hang up.